The Estill County Chamber of Commerce Christmas party was last Tuesday at the Estill County Senior Citizens Center. Admission was a $10 toy for the Toys for Tots program and a monetary donation was made as well. Pictured are the Estill County Coordinator for the program, Ken White, Chamber Director Joe Crawford, Chamber President Regina Robertson and Richard Bachman, representative of the Marine Corps. 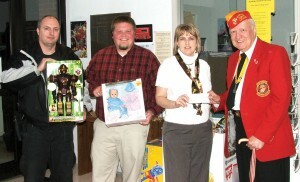 League who spearheads the Toys for Tots program.